If you are a elementary teacher looking for Science Project Ideas, the Monarch Butterfly is a fascinating subject. The butterfly life cycle is a fascinating elementary school science project. Please note that detailed information on many of these ideas are available on this website. I have linked them or click on left buttons. I now have butterfly photo sets available - great to use for bulletin boards, classroom art or home decor. Also, this monarch butterfly download or DVD are perfect for the classroom. Students love the experience of observing the butterfly stages in the classroom with these butterfly raising kits. They will be a favorite activity! 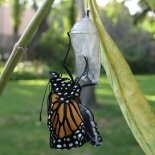 An excellent fall science project for elementary, middle school or homeschool is the butterfly science project of raising monarchs. Study fall Monarch migration - these monarchs will fly to Mexico! Here are some free Butterfly Lesson Plans on the "Life Cycle of a Butterfly". This Elementary Science Unit has Four Lessons on the Butterfly Stages. 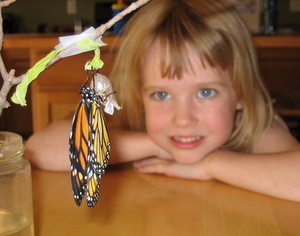 Here are more butterfly science project ideas for preschool and kindergarten students. Extend the science project ideas on Monarch Butterflies to the classroom bulletin board. Interactive butterfly stages bulletin board. Migration Map showing route of Migrating Monarchs from your area to Central Mexico. Host plant (caterpillar food) bulletin board. Purchase butterfly photos of Monarch life cycle or use the above link if you have a computer available in the classroom to talk about the life cycle of the Monarch Butterfly. Raise Butterflies in the classroom....kids love this project! Order butterfly kits or get more detailed information on monarchs and painted ladies in the classroom. Take a walk to search for Common Milkweed. This is common in "weedy" areas. 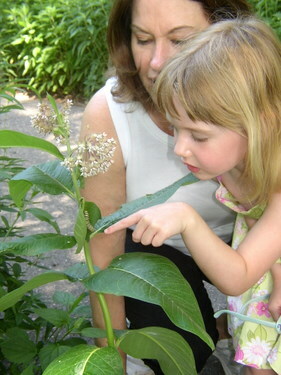 Science Activities - Buy tropical milkweed seeds and let the children plant the seeds in winter to bring home for their garden or use milkweed in the spring to raise monarchs in the classroom. Using map on bulletin board talk about the Why, Where and How of the Monarch Migration. Take walks daily in the Fall and look for migrating Monarchs. 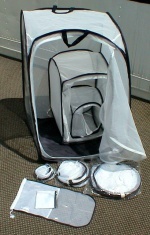 Use a butterfly net to catch Monarchs and tag them. Order Monarch tags from Monarch Watch Shop. Keep track of how many Monarchs you see each day and note the date of the last sightings. Graph tagged butterflies including tag number and date of tagging. Check tag findings at this link. How many miles do the Monarch travel from your home to overwintering sites in Mexico? How long would it take? Another great school project for an indoor setting would be a hydroponic raft. You could even grow the necessary milkweed for your caterpillar on a "lettuce raft" and create two projects in one! Access free plans for a raft here: Passive Hydroponics Plans. Homeschooling-ideas.com has some interesting homeschool science activities you could try. Get a picture of a butterfly and put it on a transparency. Have the students use markers to color it. 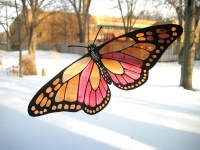 Put some tape on the underside of the body and stick it to a window (right) for a stained glass butterfly! 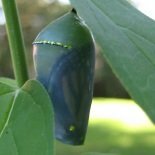 Draw or color life cycle of the Monarch Butterfly - egg, caterpillar, chrysalis and butterfly. Have the students water color a white coffee filter, then bunch up the middle of the filter with a pipe cleaner for the body and antennae of the butterfly. You can these from thread or string.